Tonight I will take 2 nephews to see the movie Big Hero 6. 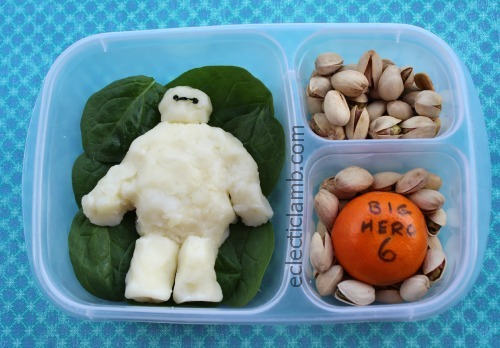 I made this Baymax as part of dinner for one of my nephews (the other does not like mashed potatoes). Left Side: Baymax (mashed potatoes, cheddar cheese, and a little butter, salt, black food coloring), spinach leaves Tip: try to make your mashed potatoes a little stiff and chill in your refrigerator until it is easier to shape. This entry was posted in Bento / Cute Food, Food and tagged bento. Bookmark the permalink. So cool! Can’t wait to catch that show!